Knowing what survival food supplies to stock can be hard at the best of times, but knowing how much to put aside can be even trickier. Many experts on TEOTWAWKI events say that families should expect to be without a source of new or fresh food for up to a year. This sounds like a long time given the average weight of groceries that Americans go through each week, but with some careful planning you can set up a regular-sized pantry with enough food to be self-sufficient for a year. You have two main choices when it comes to getting survival food supplies for a whole year. You can either do it bit by bit, adding cans and pulses to your pantry each time you go shopping or you can buy a commercially produced pack that will contain enough MREs and freeze-dried food to last you. Remember that the average person requires around 2000 calories a day just to survive, and the chances are that if you're in a situation where you're having to eat your survival food supplies the power will be out, meaning that people will need more calories to do the manual labor necessary to survive and generate body heat. Cooking oil - If your plan is to live off canned food for the year, this is possible to do but you will find some that you will need to cook. You can buy cooking oil in large volumes, but some oils will go rancid. However, coconut and olive oils will store well and not go rancid. You should be looking at around six to seven gallons for the year, more so if you have to provide for a family. Multivitamin tablets - Pound for pound, buying canned fruit and vegetables will not give you the calories that you will need to survive. It may be a while until the outside world will provide you with healthy fruit, so in the meantime you may have to resort to getting your vitamins in pill form. Fortunately, these will last for years in sealed packaging, so make sure you buy enough for one per person per day. Water purification - In an apocalyptic event, clean water may be hard to come by and you will need it for both drinking and cooking. You can find many different types of water purification, depending on your level of expertise in survival techniques, so you should experiment ahead of time so you know which ones will work for you. 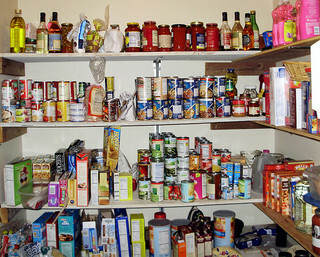 After securing the basics, you should buy extra canned food each time that you go to the grocery store. The average can of chicken stew will contain around 400 calories, so you're looking at a minimum of three cans a day per person. You will also need to invest in some dry legumes such as lentils, bean or chickpeas that can be made into much larger meals with a few vegetables and some water. Anticipate requiring around 44 pounds of dried beans to keep your family healthy for a year. The other option is to order your survival food supplies from a commercial company. The typical one-year supply of freeze-dried and dehydrated foods will consist of around 126-cans of food that will provide 2000 calories a day. The #10 cans come in stackable boxes, and only require water to prepare. However, the average price to feed two people for a year in this will run close to $1400, and take up less room than if you were to try and build all your survival food supplies by shopping at the grocery store. One #10 can of dehydrated beef stew contains approximately 10 servings, and will store for up to 25 years, while it will take up to 6-10 cans of beef stew from the grocery store to equal that and it will only store for a maximum of two years. You will need to make the judgment call as to whether you think this represents a safe investment against the worst-case scenario.